In a report required by Dodd-Frank, the Securities Exchange Commission issued its 2013 (fiscal year ended September 30) annual report. This is second full year report, thus allowing easy comparisons. A post on last year’s report appears here. The SEC continues to receive large numbers of complaints from a wide range of geographies and involving a wide range of issues. The SEC reports that the total number of complaints received in fiscal 2013 was 3,238, up roughly 8% from the 2012 level. That is nearly 9 complaints a day during fiscal 2013, including weekends and holidays. From the beginning of the program in August 20011 through the September 30, 2013 cutoff, a total of 6,573 complaints have been received. What the SEC does not say is how substantive these numerous complaints are. I know from my firm’s whistleblower systems service line that the vast majority of complaints received are not substantive, pertaining largely to employees’ concern over their work conditions and other human relations management issues. The vast majority of these complaints are certainly not the stuff that SEC investigations are made of. The SEC program includes the possibility for large monetary awards to the whistleblowers. The SEC’s rules about its reward program are summarized in their annual reports, but this article provides the most relevant details. So far, the rewards have not been that large. During the entire program only six persons have received monetary awards. One whistleblower received practically all of the money paid, at more than $14 million. Show me the Money! So, six of 6,573, or 0.09% of those making complaints received money. Perhaps this is because the program has not been in existence long enough to have resulted in payments yet becoming due. Perhaps, the folks at the SEC are slow to acknowledge that the whistleblower was really the reason the SEC was able to take action. But, my guess is that, much like the complaints that my firm receives on the whistleblower reporting systems that it runs for its clients, the vast majority of complaints are about how the complainant’s boss or co-workers are inconsiderate. Consequently, I suggest (i) those who complain about the SEC’s stinginess temper their language, and (ii) the annual SEC report provide information on the substance of the complaints they are receiving. 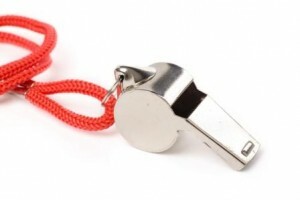 This article provides best practices in operating the whistleblower system for you company or non-profit organization.